In the case of discolored devitalized anterior teeth, several treatments are available to enhance the esthetic outcome, from noninvasive external/internal bleaching to freehand resin composites and more complex prosthetic solutions such as veneers or full crowns. Innovative computer-aided design/computer-aided manufacturing (CAD/CAM) chairside technologies and the introduction of new industrially polymerized composite resin blocks coupled with modern adhesive strategies have reduced both biological and financial costs compared to the classic post-core-crown approach. The aim of this article is to show how these new materials can be used in association with noninvasive internal and external tooth bleaching to restore a discolored, fractured, non-vital central incisor. Purpose: To evaluate in vitro the vertical seating of computer-assisted design/computer-assisted manufacturing (CAD/CAM) composite resin inlays, onlays, and overlays luted with two different composite resins. Materials and methods: Sixty plastic typodont molars were prepared for medium-sized MOD inlays, anatomic onlays, and flat overlays (n = 20); 3-mm thick at the central groove with similar morphology (Cerec biogeneric copy). Restorations were milled using Lava Ultimate blocks, and included standardized hemispherical occlusal concavity for seating measurements with an electromechanic system (force = 30 N). Restorations were luted either with preheated composite resin (Filtek Z100) or dual-cure resin cement (RelyX Ultimate). Seating of restorations was first evaluated at try-in (baseline). Seating was reevaluated after airborne-particle abrasion (Step 1), after seating with luting agent (Step 2), and after light polymerization (Step 3). The Friedman test followed by the Wilcoxon post hoc test were used to compare the seating among steps, and the Kruskal-Wallis test followed by the Mann-Whitney post hoc test were used to compare the seating between luting agents at P < 0.05. Results: Seating differences varied significantly from baseline (P < 0.0125). All restorations seated 3.85 µm (inlays) to 5.45 µm (onlays) deeper after airborne-particle abrasion (Step 1) (P < 0.007). Except for cement-luted inlays, the try-in position (±1 µm) was recovered following unpolymerized luting (Step 2). After polymerization (Step 3), onlays and overlays seated 2.9 to 3.9 µm deeper than during try-in (baseline) using Z100 (P < 0.005), and 7.0 to 7.3 µm deeper using RelyX (P = 0.005). Inlays luted with RelyX seated higher than during try-in (baseline), exactly 7.9 µm after Step 2 (P = 0.005), and 7.7 µm after Step 3 (P = 0.008). Luting with Z100 sustained the seating of inlays with no statistical difference when compared to baseline (P = 0.157). Conclusion: Airborne-particle abrasion significantly deepens the seating of CAD/CAM composite resin restorations, but the presence of unpolymerized restorative composite resin luting agent perfectly compensates for this discrepancy. Following polymerization, onlays and overlays seat deeper compared to inlays, especially when using RelyX. The latter, however, resulted in a slightly higher seating of inlays. Clinical significance: With the least variation compared to baseline seating (try-in), restorative composite resin used as luting agent resulted in the seating of CAD/CAM inlays, onlays, and overlays closer to baseline when compared to dual-cure resin cement. 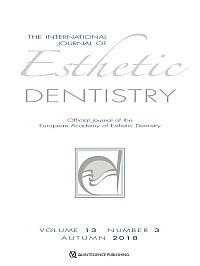 This article revisits the concept of biologic width, in particular its clinical consequences for treatment options and decisions in light of modern dentistry approaches such as biomimetics and minimally invasive procedures. In the past, due to the need to respect biologic width, clinicians were used to removing periodontal tissue around deep cavities, bone, and gum so that the limits of restorations were placed far away from the epithelium and connective attachments, in order to prevent tissue loss, root exposure, opening of the proximal area (leading to black holes), and poor esthetics. Furthermore, no material was placed subgingivally in case it led to periodontal inflammation and attachment loss. Today, with the more conservative approach to restorative dentistry, former subtractive procedures are being replaced with additive ones. In view of this, one could propose deep margin elevation (DME) instead of crown lengthening as a change of paradigm for deep cavities. The intention of this study was to overview the literature in search of scientific evidence regarding the consequences of DME with different materials, particularly on the surrounding periodontium, from a clinical and histologic point of view. A novel approach is to extrapolate results obtained during root coverage procedures on restored roots to hypothesize the nature of the healing of proximal attachment tissue on a proper bonded material during a DME. Three clinical cases presented here illustrate these procedures. The hypothesis of this study was that even though crown lengthening is a valuable procedure, its indications should decrease in time, given that DME, despite being a very demanding procedure, seems to be well tolerated by the surrounding periodontium, clinically and histologically. González, David / Cabello, Gustavo / Olmos, Gema / López Hernández, Emilia / Niñoles, Carlos L.
The buccal bone wall is the part of the socket of an anterior tooth that is most susceptible to resorption. Immediate implants offer advantages in terms of time, comfort, and esthetics, especially regarding the maintenance of the papillae architecture. However, the loss of the buccal bone wall is often a limitation for such a therapy. This case report describes a clinical procedure designed to reconstruct the buccal bone wall to restore an anterior tooth where this wall was absent. The approach involved a flapless immediate implant based on the principles of guided bone regeneration (GBR), and consisted of the preparation of a large, flapless recipient bed ad modum envelope, immediate implant placement, deposition of xenograft surrounding the implant surface, and coverage with a collagen membrane. Finally, a palatal connective tissue graft (CTG) was placed, and the natural tooth crown acting as a temporary restoration was delivered. One year later, a zirconia-ceramic crown was delivered. Two years after implant placement, the soft tissue level was stable. No signs of inflammation or bleeding were observed, and periapical radiographic examination revealed bone stability. Purpose: To investigate periimplant soft tissue response following flapless extraction and immediate implant placement and provisionalization (IIPP) associated with bovine hydroxyapatite bone and connective tissue grafting in the anterior maxilla. The study evaluated the effectiveness of this technique in terms of soft tissue contours in esthetic areas with the use of the pink esthetic score (PES). Materials and methods: In this retrospective study, 39 consecutive patients were treated and followed by two experienced clinicians for single-tooth implant treatment in the esthetic zone. Treatment consisted of flapless extraction, immediate implant placement, inorganic bovine bone filling of the periimplant gap, and connective tissue grafting. A provisional crown was placed at the time of implant placement. The final crown was positioned 5 to 8 months after surgery. To assess the esthetic outcome of the technique, the soft tissue around the tooth to be extracted was scored according to the PES by seven evaluators before the surgery at visit 1 (v1), and at least 1 year after the final prosthesis placement at visit 2 (v2). Results: After a mean follow-up of 4 years, the mean total PES score on a scale from 1 to 10 was 5.64 and 7.07 at v1 and v2, respectively. Statistical analysis revealed a significant difference between the PES scores before surgery and at the follow-up examination of the anterior single implants (P = 0.0008). Conclusion: Within the limitations of this study, postextraction with immediate implant loading associated with bovine hydroxyapatite and connective tissue grafting is a predictable technique. The esthetic outcome is that soft tissue seems to be maintained or improved significantly according to PES assessment compared with baseline. This study evaluated the effectiveness of resin infiltration or enamel microabrasion for restoring color changes caused by incipient carious lesions as well as the color stability achieved by these treatments. Enamel specimens were subjected to cariogenic challenge to produce white spot lesions (WSLs) using a microcosm biofilm model. These lesions were treated with resin infiltration or enamel microabrasion (n = 8), and color changes were measured with a spectrophotometer at baseline and after the treatments. Untreated specimens were used as a control. The treated specimens were then immersed in coffee for 1 week, and tooth color was measured again. Data for ΔL*, Δa*, Δb*, and ΔE were analyzed by two-way repeated measures ANOVA and Tukey's test (α = 0.05). Caries induction resulted in significant color changes, mainly decreased lightness. Neither resin infiltration nor enamel microabrasion were able to restore tooth color. The specimens subjected to resin infiltration and the control specimens were more susceptible to color changes following immersion in coffee. In conclusion, enamel microabrasion and resin infiltration were unable to restore the initial tooth color observed prior to WSL induction. Moreover, resin-infiltrated enamel seems more susceptible to staining solutions than enamel subjected to microabrasion.